Gorgeous home with breathtaking views! 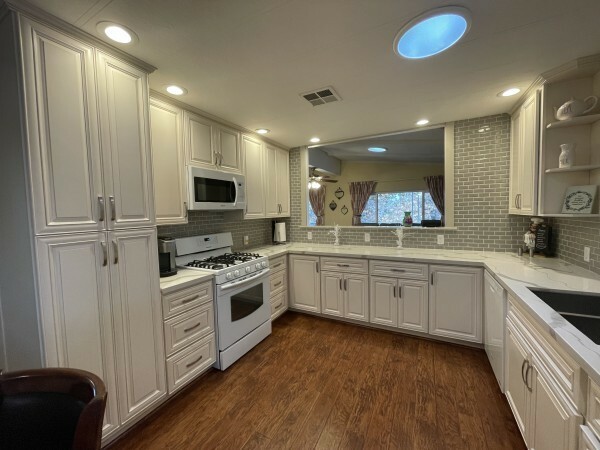 Overlooking greenbelts, this home has been completely and tastefully remodeled. Newer central A/C and furnace, newer appliances, newer water heater. Beautiful dual pane vinyl windows, laminate wood flooring throughout, stunning 5" baseboards. Recessed canned lighting with LED bulbs in kitchen & baths. Gourmet kitchen features high quality cabinets & quartz counter tops. Granite counter on island. Indoor laundry room includes newer washer & dryer, storage cabinets. Ceiling fans in most rooms, solar tubes allow natural sunlight to shine through. Master bedroom has beautiful mirrored closet doors and a private bathroom. Master bathroom features a soak-in tub and large shower stall. Guest bedroom and bathroom. Enjoy your coffee on your wrap around deck while enjoying the view of the luscious greenbelt and trees. Large integrated storage shed under carport. Additional storage shed on one side of the home. Great private patio area. Formal living and dining areas in addition to the bonus/family room. Lease expires 2037. Call to view today! Senior community; 1st resident must be 55 or older, other residents within the same household must be 45 or older. Clubhouse features a 3-table billiard room, card room with small library, and a full-sized catering kitchen. The main reception room is large enough to seat about 200 people. About 4 miles from the ocean.